Cross-company crossovers rarely succeed. They just have too much “cross” in them. Meaning? Meaning most of the time they operate in that fuzzy, two-layered “imaginary” imaginary story zone, where characters meet and on a neutral field with neither side carrying their steamer trunks of established continuity with them. The first encounter of DC and Marvel characters, the famous Superman vs. The Amazing Spider-Man, set that pattern, with the two heroes running up against each other for the first time within those pages despite both being established do-gooders within that pocket shared universe, and with both apparently the world’s sole champions of truth, justice and the American way. As if they both appeared fully formed moments before the events of the first page. It’s not that this is a terrible device. In fact, it’s probably necessary. You can’t craft anything lasting out of chance meetings, one-night stands that will be forgotten the next month, so there’s no use in having them carry any plot souvenirs with them or back through customs. This undercuts the storytelling, though. It robs the plot of permanence, and turns it into nothing more than a Dallas dream season. Bobby Ewing may not show up in the shower on the last page of these crossover comics, but he’s there in spirit. So you have to go in with these things in mind — actually, you have to read the book with them out of your mind. And if you do that? Then you might find some fleeting but real pleasure in the double layers of imaginary. 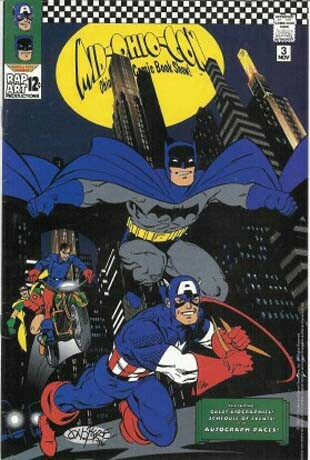 And that’s just what happens in John Byrne’s Batman & Captain America. Bucky and Robin are both along for the ride, and there’s some wife sidekick swapping as the two young partners team with their opposite’s mentor. (There’s no reason for this, but it’s so apt and fun, who can complain?) The Joker and the Red Skull are naturally the real villains behind the doings with the bomb, and their team-up is the one that provides the most surprises. Which is a more potent killer, the Joker’s laughing gas or the Skull’s Dust of Death? Who will be the first the double-cross the other? Which of the two will make an oddly heroic late in the game stand? It’s worth it to track down the book to answer those questions alone, and it’s a fine read apart from the settling of nerdy debates. A simple one-shot romp with big guns is right in the wheelhouse of John Byrne’s skillset. This is one cross-company mixer that rises to the top of the pile — or as high as one can go with the narrative boat anchors that always hold them down. I really enjoyed this book. Like you I usually ended up underwhelmed by cross-company crossovers, and also, by the early 90s, most of Byrne’s output (“Generations” had been a recent let-down), but this one just really “clicked” for me, and the surprise ending was a great tribute to DC’s earliest “imaginary story” franchise. I still don’t know what compelled me to take a chance on the book, but I’m really glad I did. Totally forgot to mention Generations, which the book feels a lot like — especially the flash-forward ending. Thanks for the link.